DevaCurl Kit for All Curl. Deva Curl Super Curly Kit. Condition is New. Shipped with USPS First Class Package. DEVA CURL KIT. BUILD UP BUSTER 1.5 OZ. 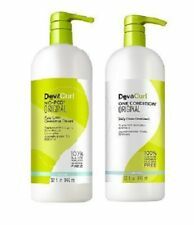 DevaCurl Supercream Coconut Curl styler 3 oz. Deva Curl DevaCurl Super Curly Spring Kit. DevaCurl No Poo Decadence ( Shampoo) 8 oz. DevaCurl Reboot Repair Restore Curls On The Go Treatment Trio Kit - NEW & FRESH! CONTAINS: BUILD UP BUSTER CLEANSING SERUM 1.5oz. DEVA CURL SUPER CURLY CARE KIT. Condition is New. Shipped with USPS First Class Package. Step 1: No-Poo Zero Lather Conditioning Cleanser. 3-Step Introductory Sample Kit. Step 2: One Condition Ultra Creamy Daily Conditioner. Step 3: Light Defining Gel. No-Poo leaves you with shiny, bouncy curls that are just plain gorgeous. This set contains Which hair type is it good for?. Rinse as needed. -Work a liberal amount of No Poo vigorously throughout your scalp and gently through the ends of your hair. The easiest thing you can do to get gorgeous curls is to ditch your shampoo. This Kit contains: -No-Poo Original, 8oz: This award winning, zero-lather cleanser gently gets rid of dirt and buildup without drying out your curls. Kit De Champú Y Acondicionador Para Cabello Encortijado / Rizado - Devacurl - 32 Oz Cada Uno. Tipo de cabello: ensortijado y rizado. Incluye champú y acondicionador. Condición del artículo: el 100% auténtico, nuevo y sin uso. Deva Curl Miracle Works Wavy Kit Set Condition is New. Shipped with USPS Priority Mail. Curly Care Kit Includes 1- 1.5 oz. Styling Cream. Set It Free. You might need an adapter to use the product in your country. on all orders. This Kit contains: -No-Poo Original, 8oz: This award winning, zero-lather cleanser gently gets rid of dirt and buildup without drying out your curls. We would love to be given the opportunity to work with you to resolve any problem you may have. This Kit contains: -No-Poo Original, 8oz: This award winning, zero-lather cleanser gently gets rid of dirt and buildup without drying out your curls. #105 in Shampoo & Conditioner Sets.